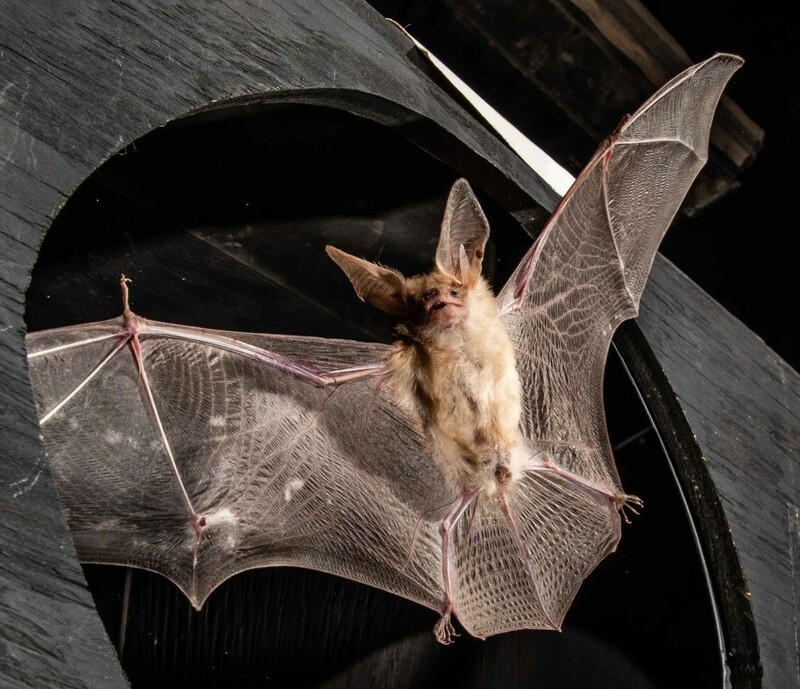 Spotted Bats are one of the rarest and hardest to catch bats in the USA. 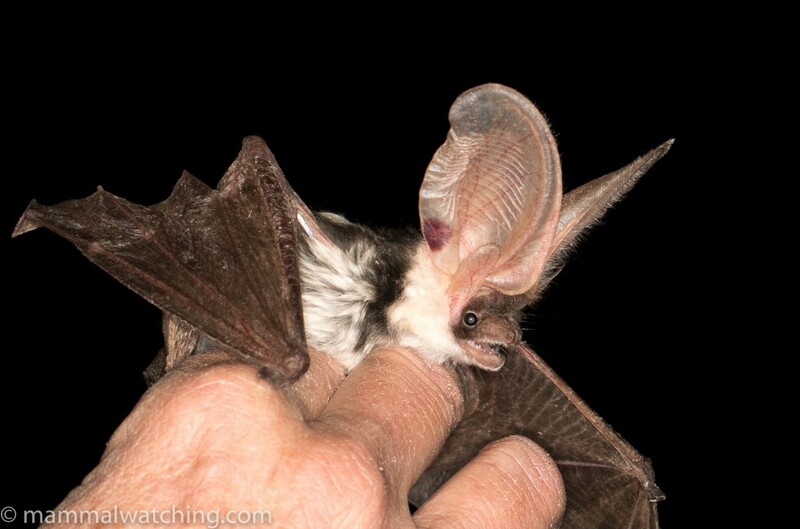 They are also arguably one of the most impressive bats in the world. And the species has been on my Top 21 Mammals To See list since I moved to the USA 6 years ago. In fact they stayed on the list even after I saw them in flight last year: this is a species you want to get up close and personal with. So when Fiona Reid told me she was thinking of organising a trip to try to catch them I signed up quicker than you can Euderma maculatum. If the prospect of a bunch of new bats wasn’t enough, this was also more worthwhile than the usual mammal trip: the proceeds would go towards supporting Jose Gabriel Martinez, legendary Nicaragua Yapok catcher, who started his doctorate in Northern Arizona University at the start of the year. Was this the first ever mammal watching benefit gig? 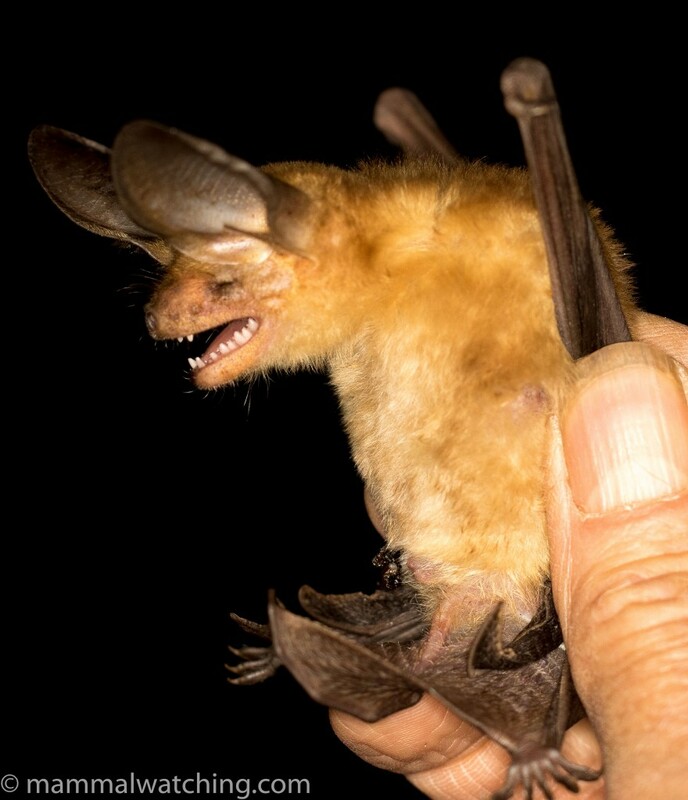 Jose’s supervisor, Professor Carol Chambers, is the world’s foremost Spotted Bat guru, so naturally she and Fiona organised the trip and arranged it to coincide with the very end of the dry season when captures would be most likely. In early July a dozen or so of us met up in Flagstaff for several nights of batting. The group included mammalwatching.com regulars Charles Hood, Steve Morgan and Venkat Sankar. My son Patrick came along too, though he was far more excited at the prospect of Black Widows and Sun Spiders than the bats. Yes I often considered adoption, but would his mother listen to me? My first stop was a quick detour to Sweetwater Wetlands in Tucson. 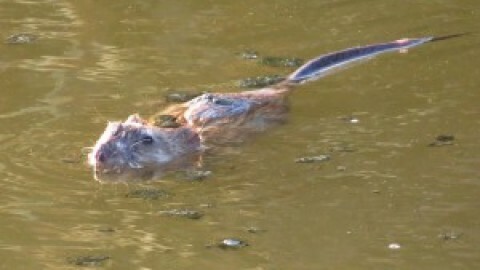 I visited here in 2013 but didn’t see an Arizona Cotton Rat, reputedly common in the park. I had more luck this time and saw one or two animals within 30 minutes of arriving at 6 a.m. 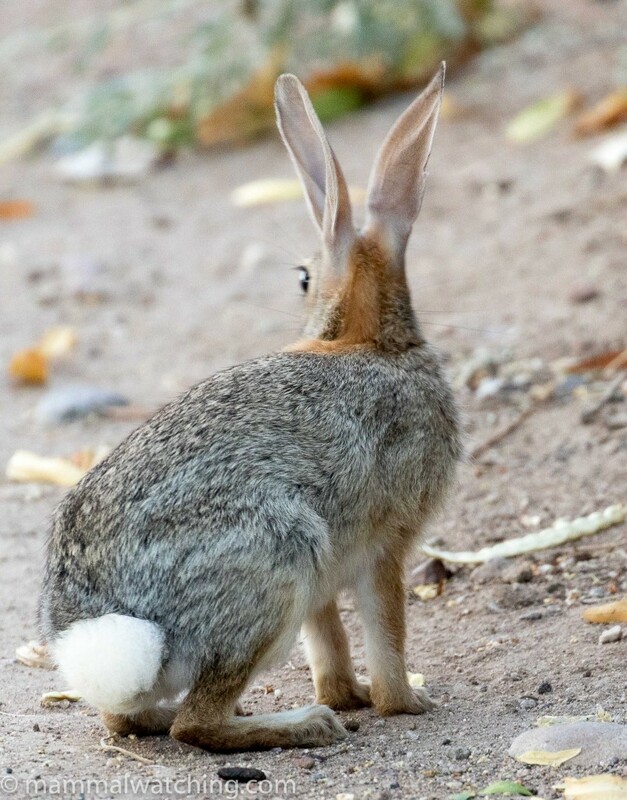 I also saw a bunch of Desert Cottontails, a couple of Black-tailed Jackrabbits and an insomniac Raccoon. When I got back to the small parking area, a group of Round-tailed Ground Squirrels were active at 8 a.m.
Allen’s Big-eared Bat, Idionycteris phyllotis. Photo Jose Gabriel Martinez. 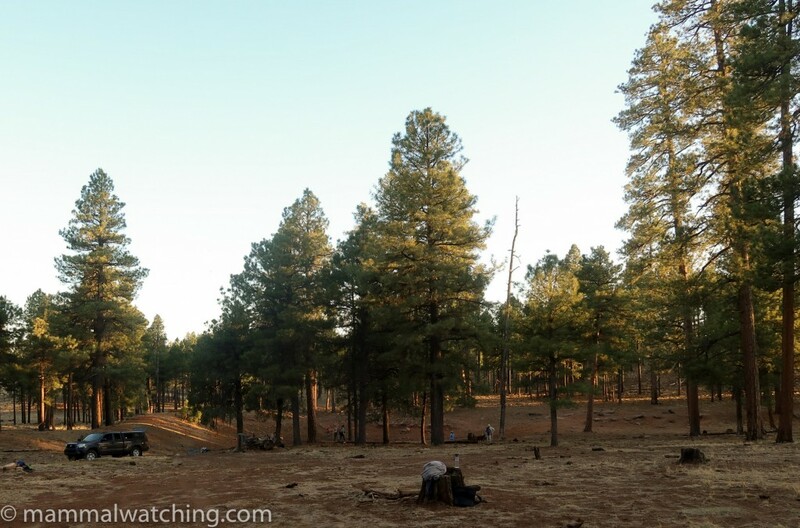 The organised bit of the trip started in Flagstaff, with a night’s mistnetting about an hour out of town, over a small pond in open conifer forest. We’ve been asked not to give details of any of the locations. It was a fabulous first night. We caught over 100 animals, from ten species, six of which were new for me. 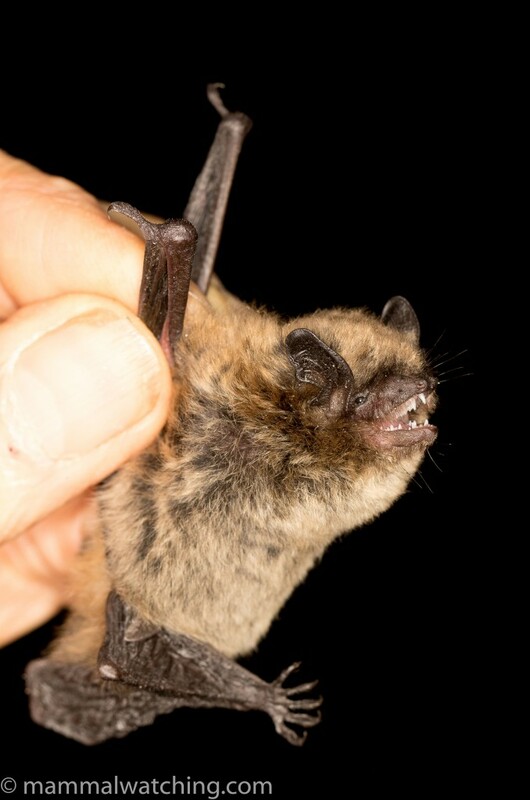 The netting was dominated by three species: Arizona Myotis, Fringed Myotis and Big Brown Bats. 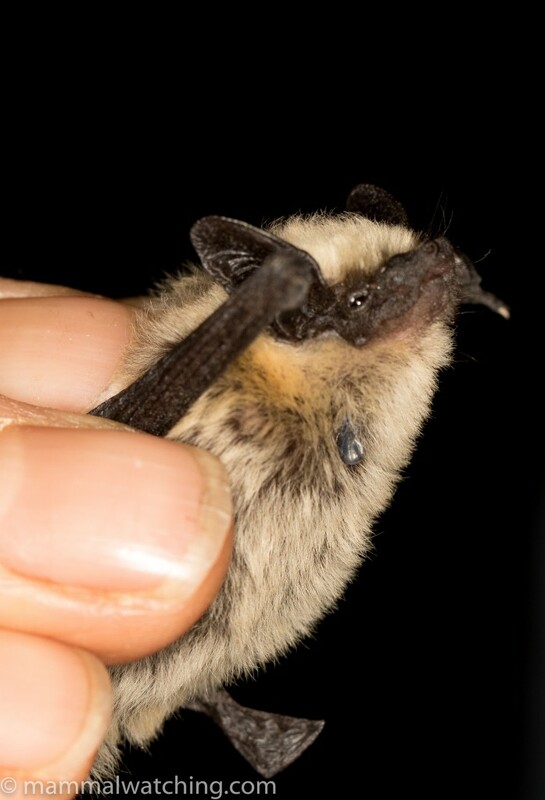 We caught 28 Arizona Myotis, a lifer for me. 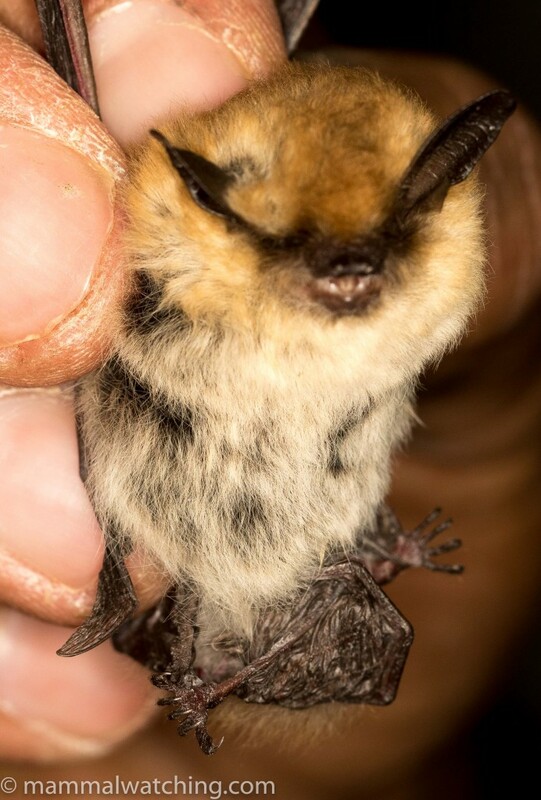 We caught 40 Fringed Myotis, another lifer. 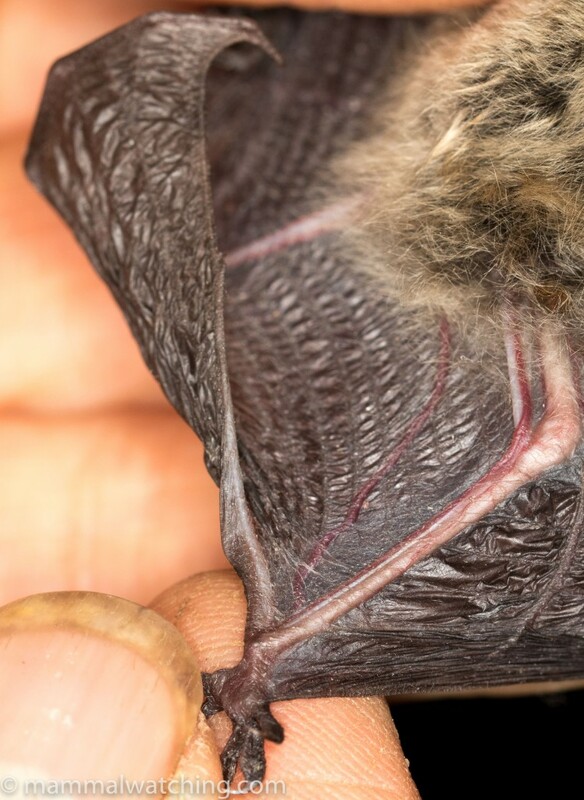 Fringed Myotis, Myotis thysanodes: Note the fringe of fure on the edge of the tail membrane. The fringe of hair on the edge of the tail membrane is diagnostic. And we got 30 Big Brown Bats. The only other species we caught more than one of were three Silver-haired Bats. Yet another lifer. We caught singles of another six species. 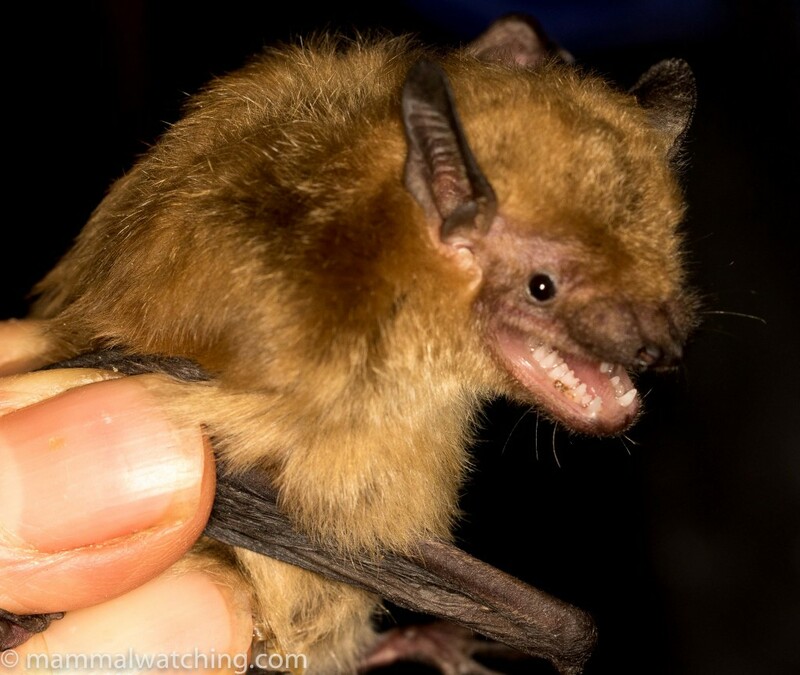 This Southwestern Myotis was the only one of the trip. 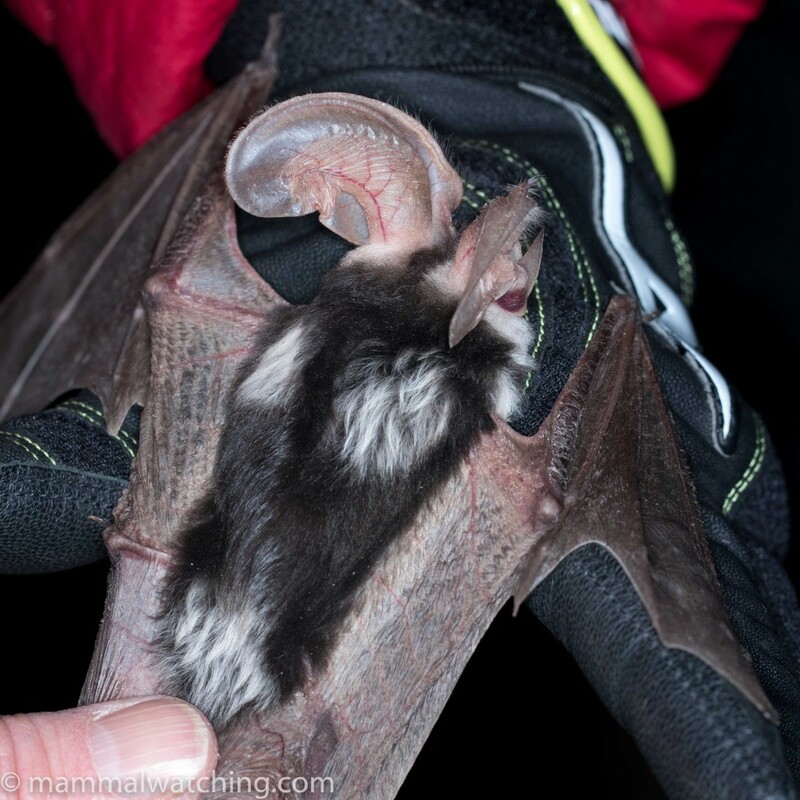 One of several Pallid Bats we caught over four nights’ netting. 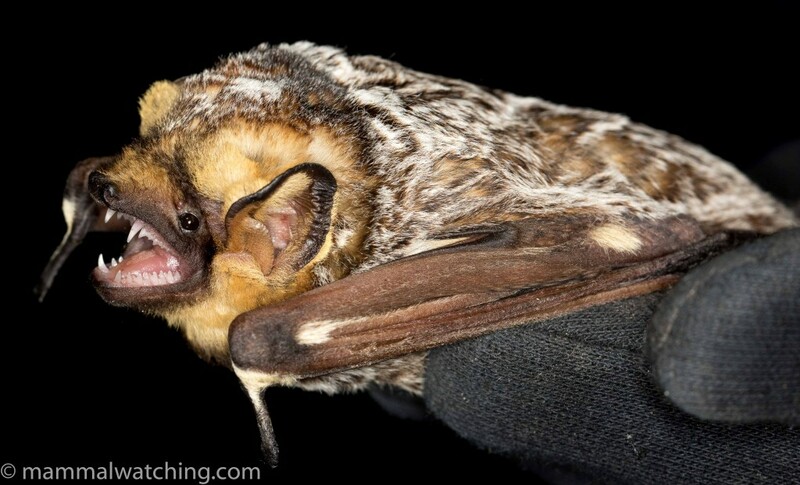 These bats are scorpion specialists. 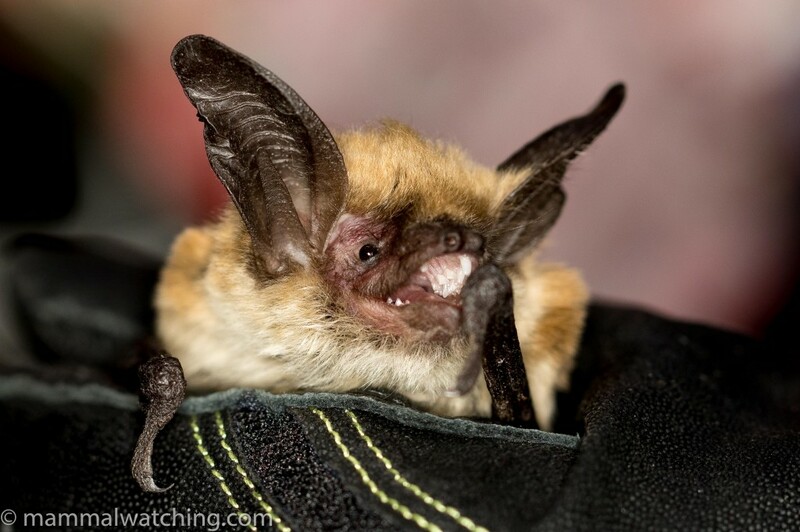 Long-eared Myotis are another impressive species. I didn’t photograph the lone Brazilian Freetail we caught, but everyone wanted pictures of this Hoary Bat. Such a great species: its hissing vocalisations almost as impressive as it patterned fur. 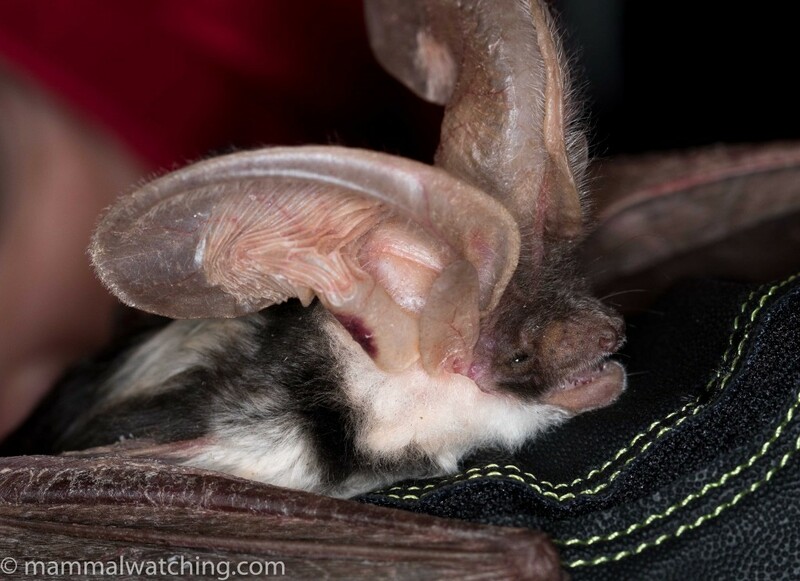 But the best species that night was surely this Allen’s Big-eared Bat, the only one of the trip and a species Carol had been specifically targetting here. 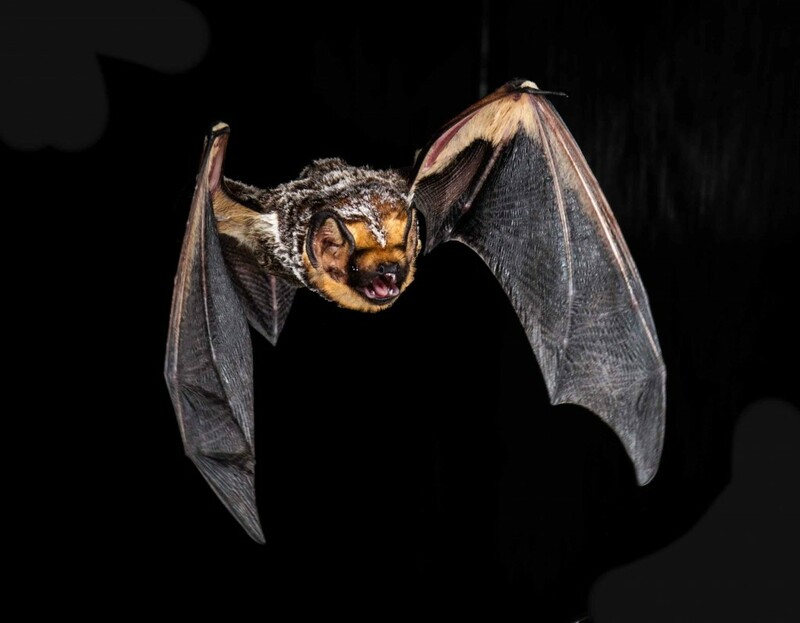 A striking bat, and the curious lappets across the top of the animal’s eyes are distinctive. 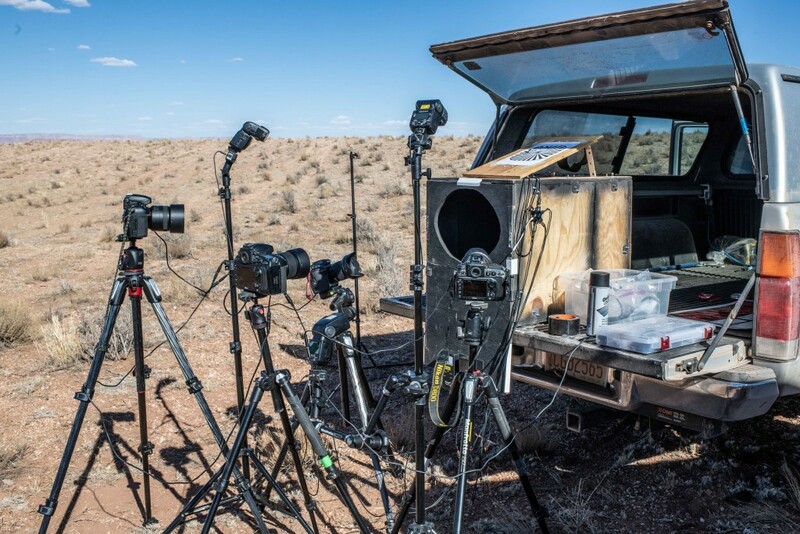 Meanwhile Charles and Jose had set up their own portable bat studio, releasing bats into a wooden box to capture in-flight shots of them as they emerged. They got some very impressive results. 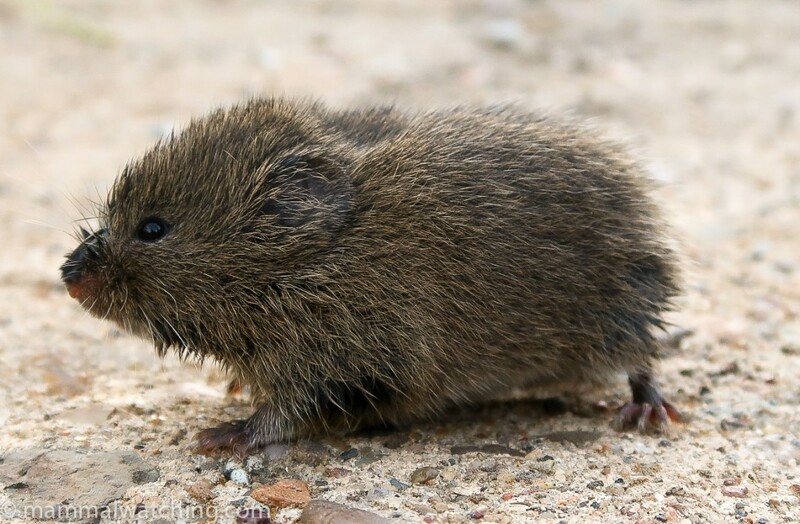 I didn’t see many other mammals around Flagstaff, other than several Elk on the way to the netting site, and a couple of Mogollon Voles that Jose Gabriel helped me find in long grass along a creek at Kachina Village here. There are Mexican Woodrats here too but we couldn’t find any. 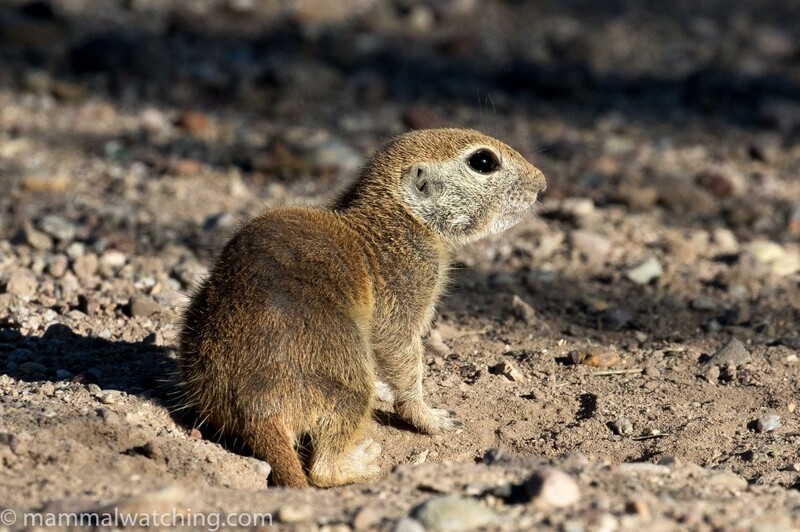 Patrick spotted a Gunnison’s Prairie Dog along East Butler Avenue (where I40 crosses over it) downtown, and Steve Morgan saw an Abert’s Squirrel in the garden of the AirBnB on North Spyglass Way. 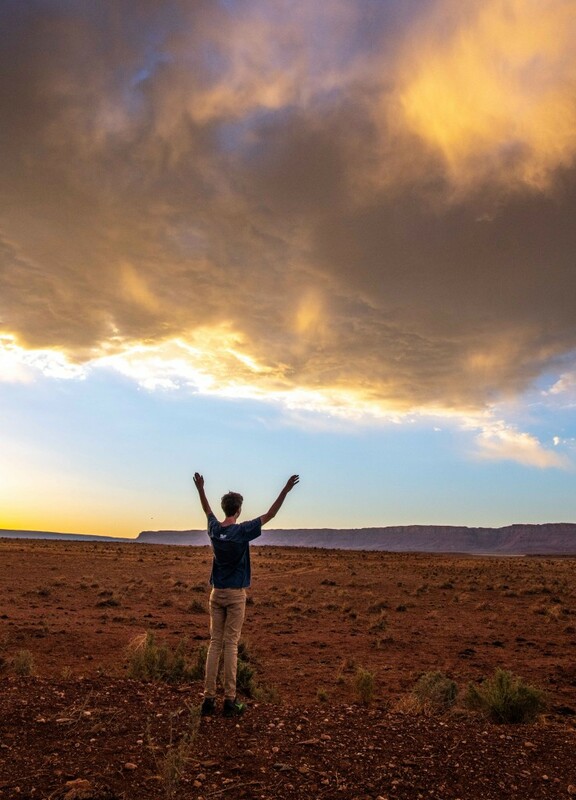 The next two night’s batting was close to Vermillion Cliffs National Monument along Route 89a north of Flagstaff. 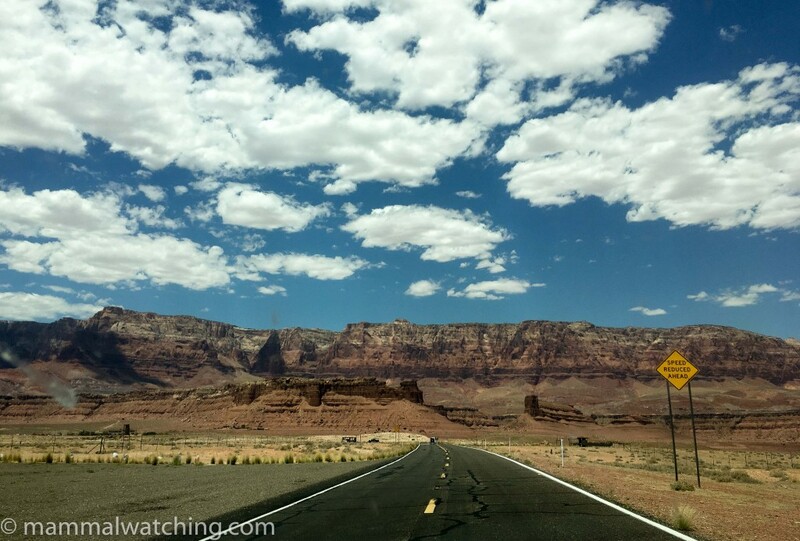 The stretch of highway between Bitter Springs and the national monument has superb scenery. Patrick was told by me – at least once every five minutes – “Look Patrick. Look. Its fantastic”. It was almost enough to persuade the poor boy to divert his gaze from the game he was staring at. Almost. 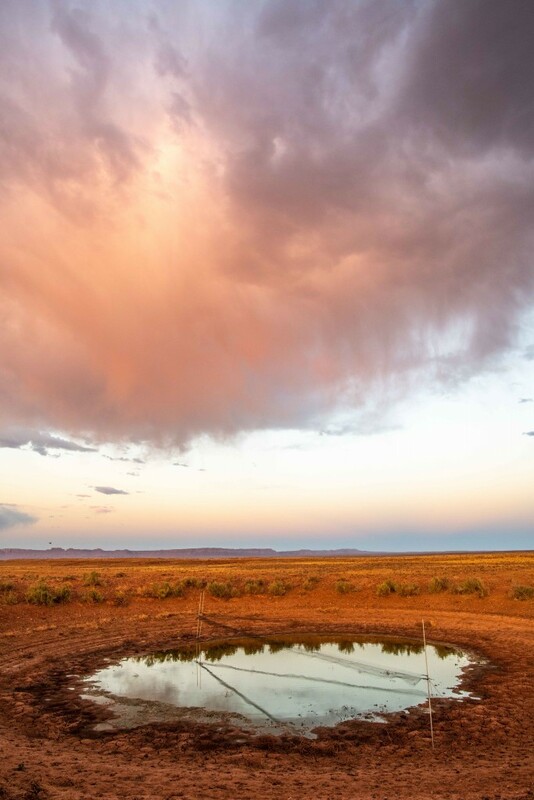 The two netting sites, both small ponds full of – and surrounded by – cow crap, were rather less inspiring than the scenery. 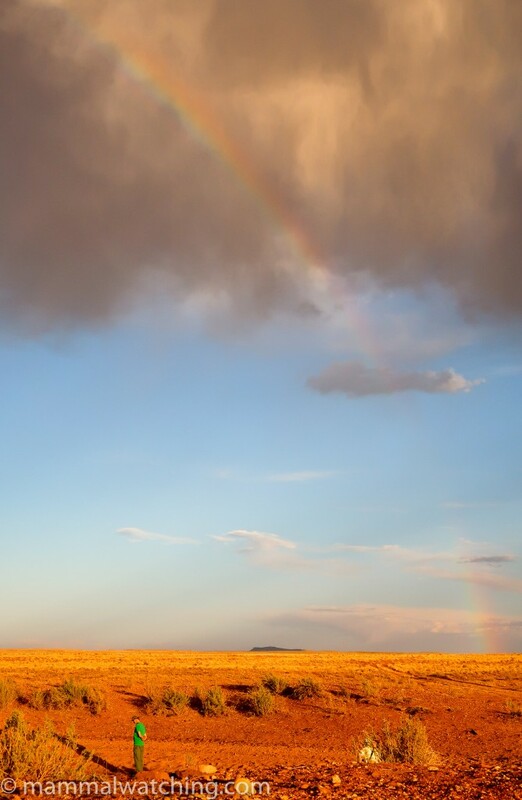 Though the evening clouds (signalling the build up to much overdue rain) added some extra drama to the landscape. The batting here on both nights was slower than the first night. We caught 56 animals and 33 animals over the two evenings, comprising 6 and 5 species. Tiny Canyon Bats (Western Pipistrelles) dominated the first evening and there were dozens skimming our heads from well before sunset. 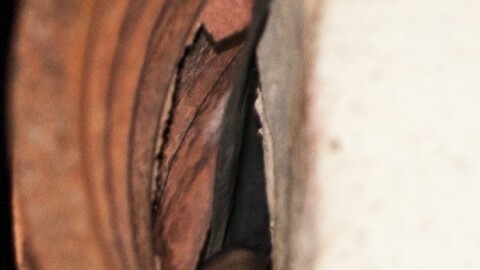 The picture from Charles (below) shows how tiny these bats are. 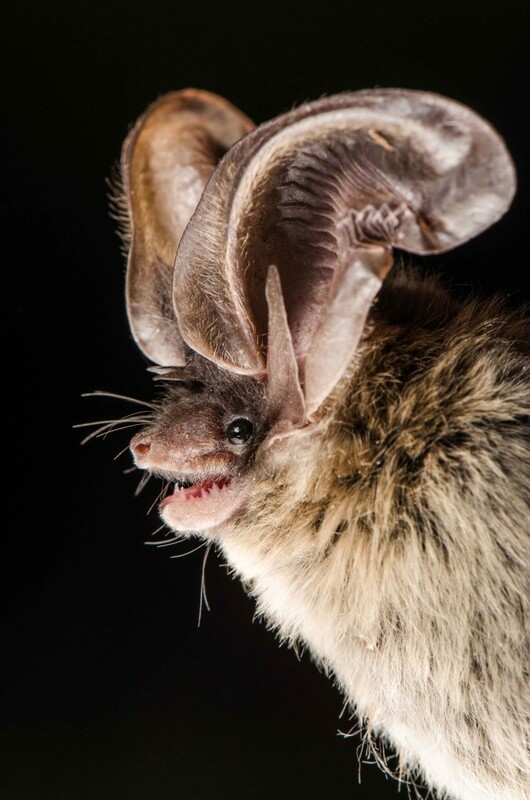 Canyon Bat, Parastrellus hesperus. Photo Charles Hood. 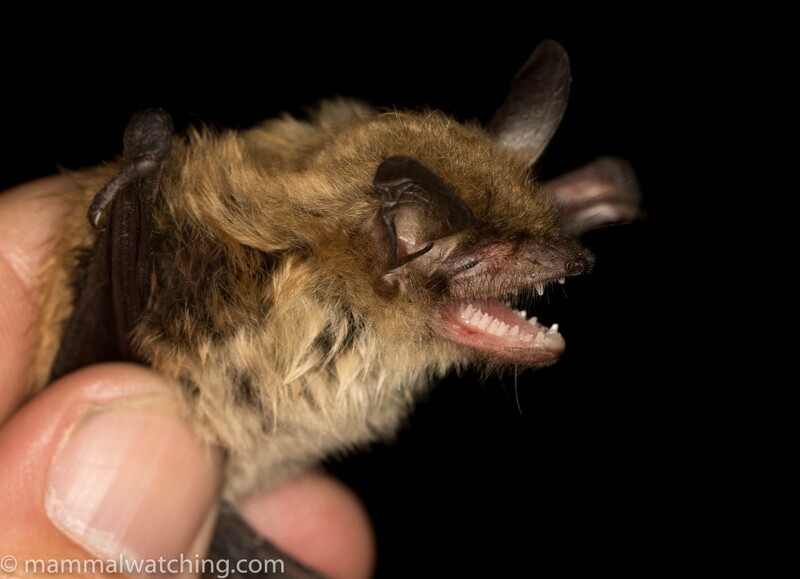 California Myotis dominated the second evening. Though Carol had caught Spotted Bats quite often at both locations, and we heard them close to the nets both nights, we weren’t lucky. 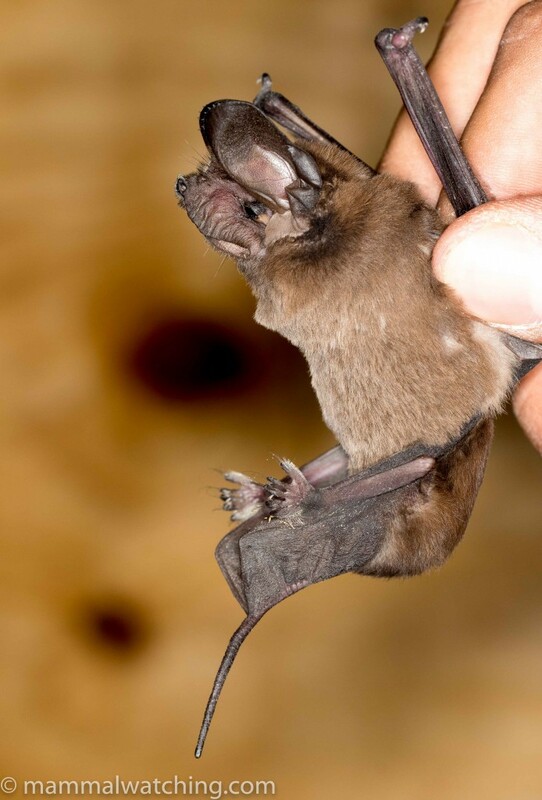 The best bats for me were the impressive Big Free-tailed Bat. We caught three on the first evening which was exciting: this was a species that Carol thought we would be quite unlikely to catch. And yes, another lifer for me. In between the bats there was plenty of time to enjoy some of the most spectacular starscapes I’ve ever seen. One of the group saw what sounded like a Long-tailed Pocket Mouse close to the nets. But the only mammals I saw were several Black-tailed Jackrabbits. We did though see a Badger both nights on the drive out. Jose and I gave chase to this one to ensure it stuck around long enough for everyone to see. They can move pretty quickly when they need to and even the fearless Jose resisted the impulse to try to pick it up. 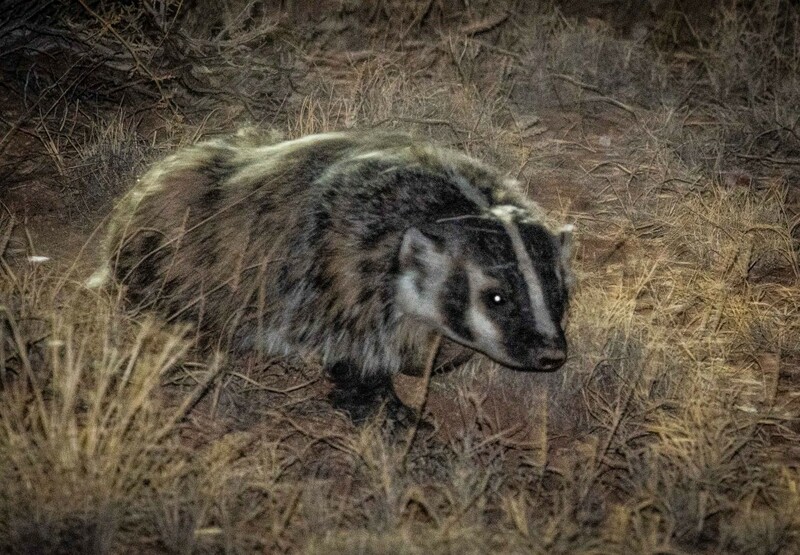 American Badger, Taxidea taxus. Photo Charles Hood. Surprisingly I only saw a single kangaroo rat on the drives home each night: most likely an Ord’s Kangaroo Rat. Chisel-toothed Kangaroo Rats are also in the area, though presumably on rockier ground. 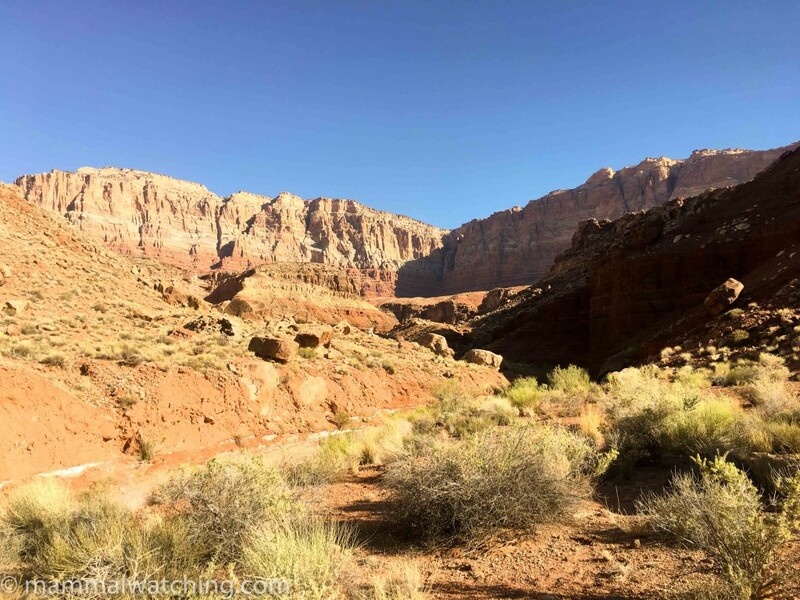 The Honeymoon Trail – that starts from next to Cliff Dweller’s Motel up a shaded gorge with a trickle of water – seemed like a good place to try to catch rodents. There was plenty of evidence of wood rats along here, but all I caught were a few Canyon Mice. 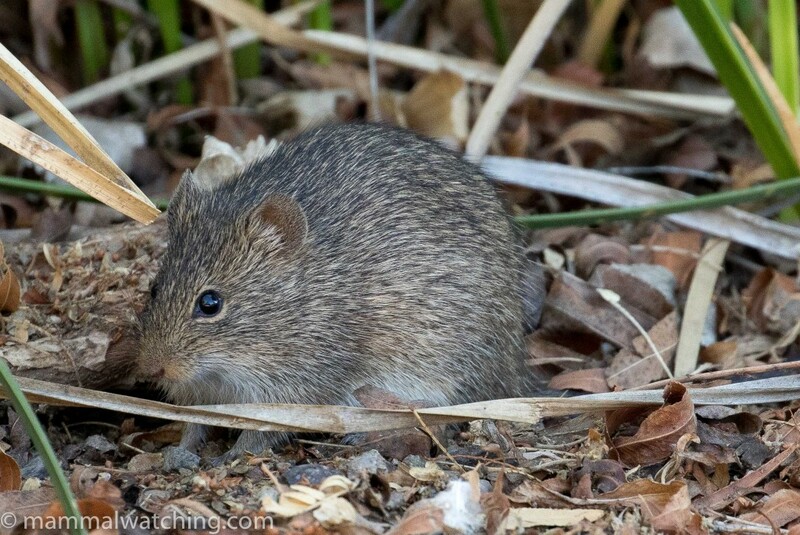 Canyon Mice are quite small, with long furred tails and large ears. White-tailed Antelope Squirrels were very common in and around Cliff Dwellers Motel. 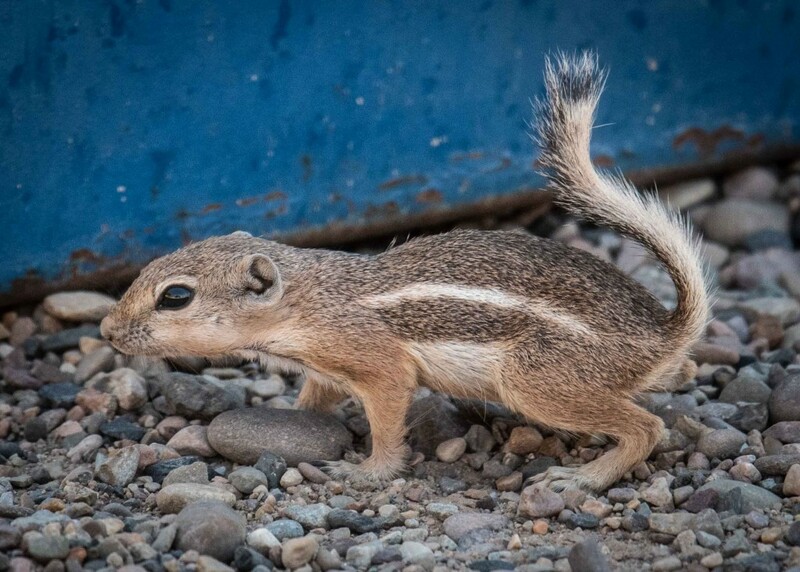 White-tailed Antelope Squirrel, Ammospermophilus leucurus. Photo Charles Hood. On day four, with still no Spotted Bats, I was trying to manage my stress levels, already in the danger zone after watching the England Colombia World Cup penalty shootout. 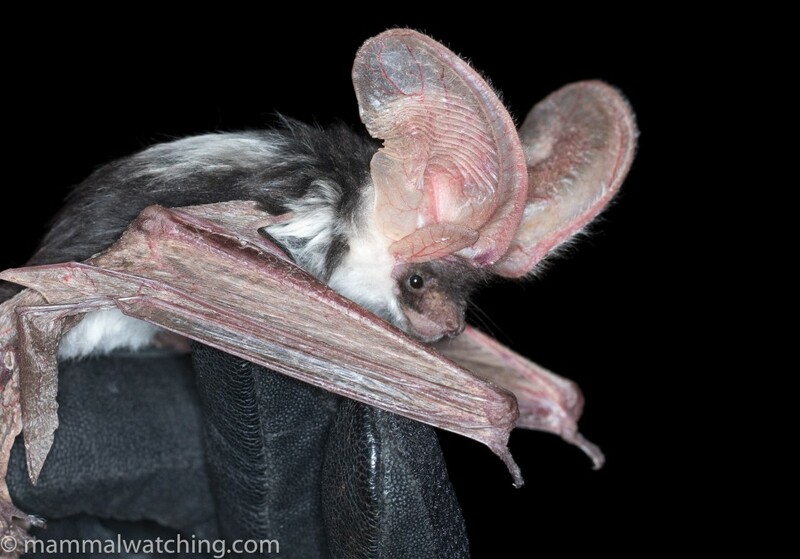 But, ever since I’d first heard about Spotted Bats, I’d imagined I would see one on the Kaibab Plateau, next to the North Rim of the Grand Canyon. And that was the destination for our last night. I was cautiously optimistic. 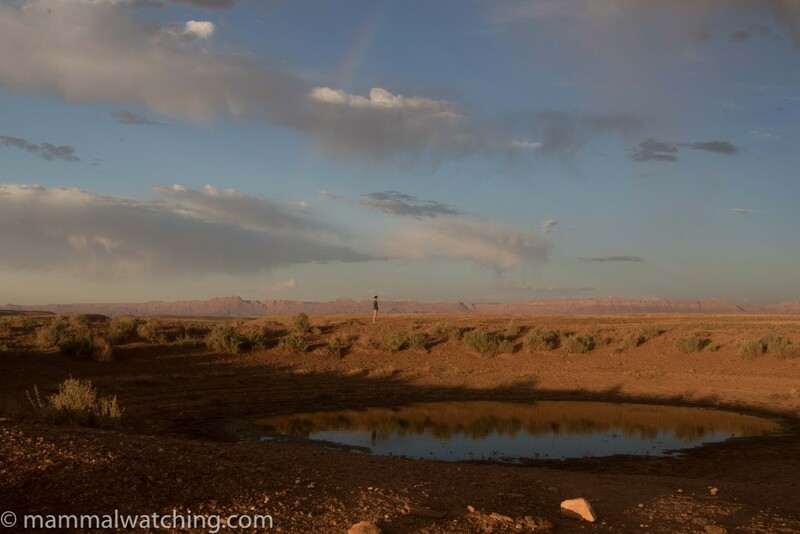 We spent a few hours that afternoon poking around the plateau. Venkat and Hari Sankar spent the morning there too, and shared directions for a spot where they had seen the newly split Fremont’s Squirrel (a split from the Red Squirrel). 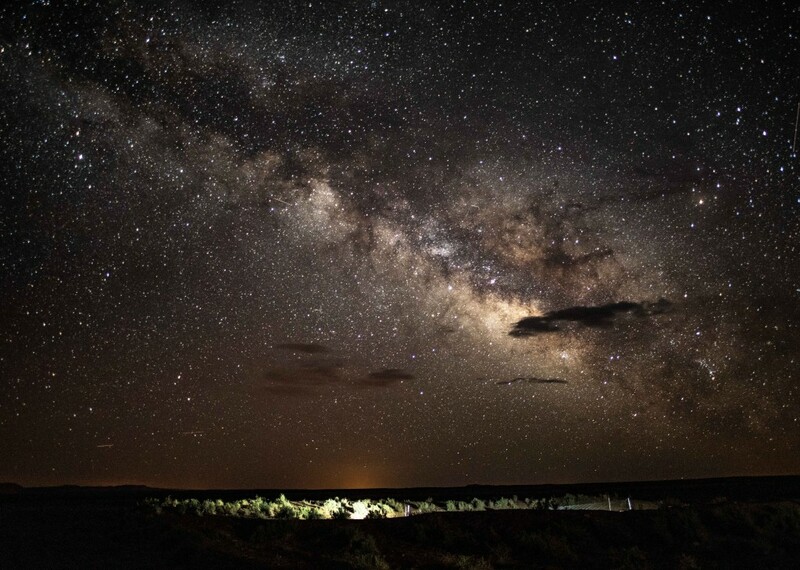 It took less than three minutes to find one in the forest at the edge of a meadow on the west side of Route 67, between Jacob Lake and the North Rim of the Grnad Canyon, at mile marker 596. Happy with my lifer squirrel we argued over chipmunk IDs at Jacob’s Lake and around the North Rim of the Grand Canyon. 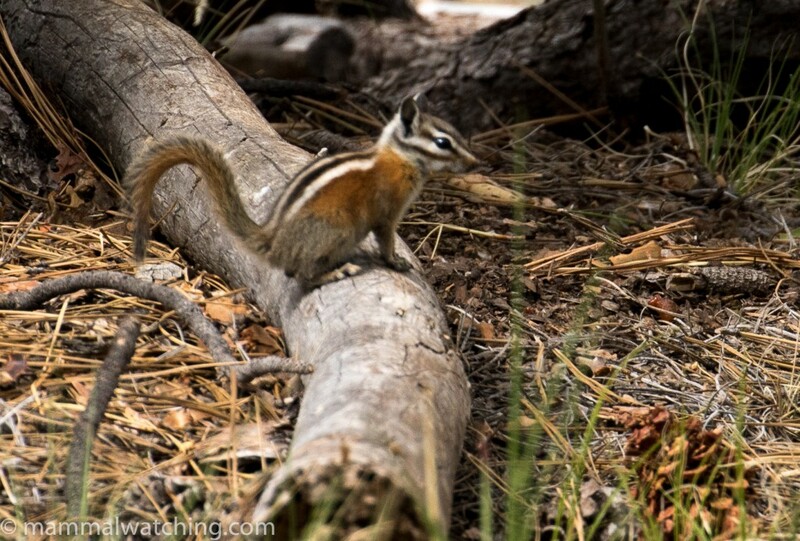 Most appeared to be Uinta Chipmunks though Colorado Chipmunks ought to be around here too. 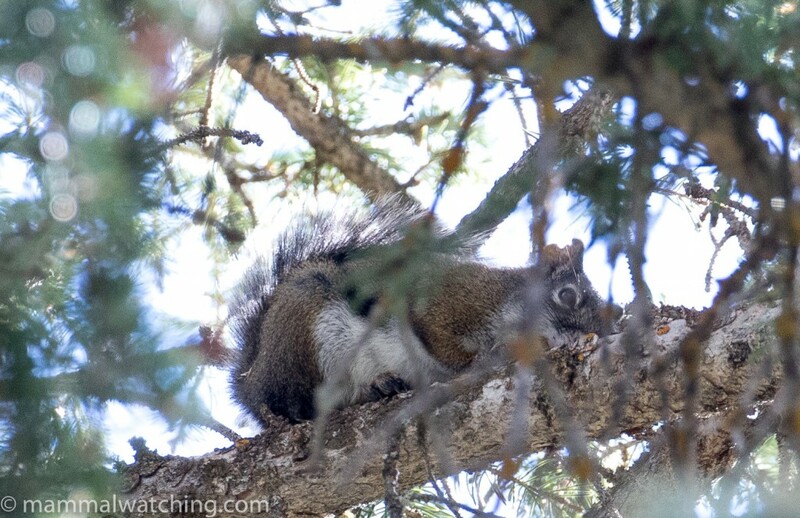 We couldn’t find an Abert’s Squirrel, though Venkat had scored earlier in the day in the campsite at the north rim. 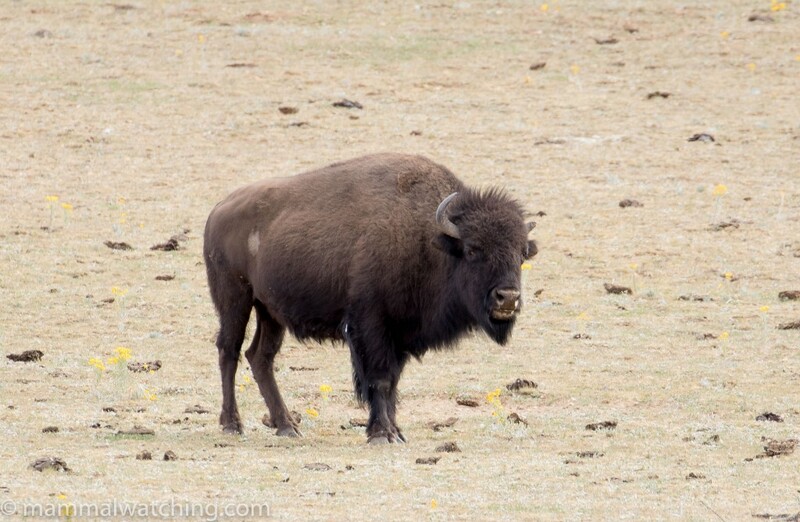 But it was impossible to miss the Bison, just past the national park entrance gates: the herd were introduced here at the very start of the 20th century. The only other mammals that afternoon were a Rock Squirrel in the forest, and many Mule Deer and Elk along the road from the national park to Jacob’s Lake. 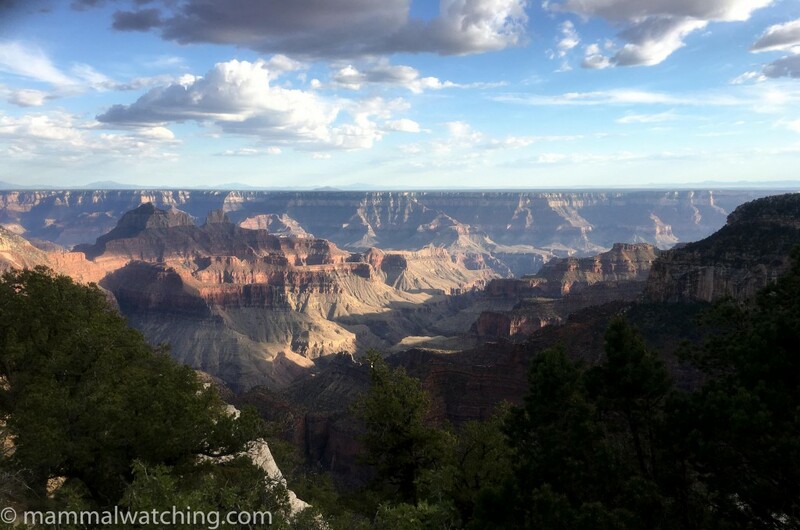 After the obligatory 20 minutes gawping at the Grand Canyon, we returned to meet Carol and the crew near Jacob’s Lake for the evening’s netting over a pond in a pine forest meadow. Carol had warned us all how cold it can get at night up here: she has caught Spotted Bats flying in summer temperatures around freezing. 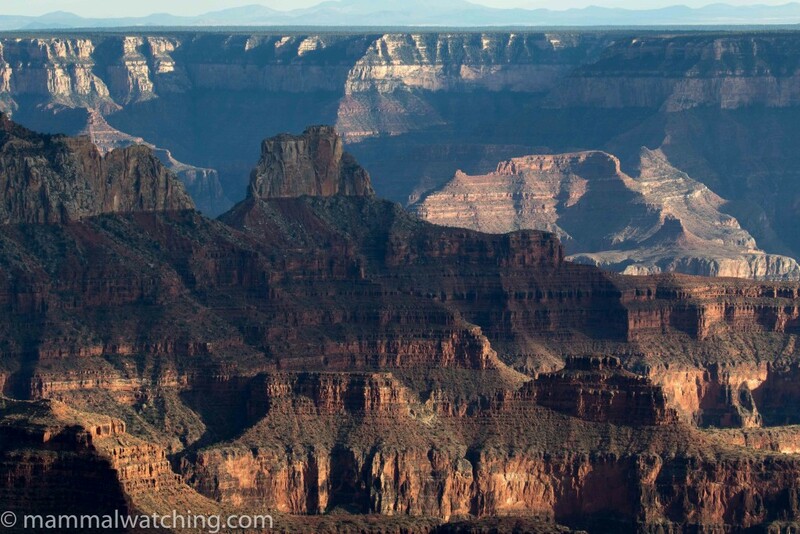 And though the previous nights had barely warranted a jacket, tonight – up at over 8000 feet – quickly cooled down. 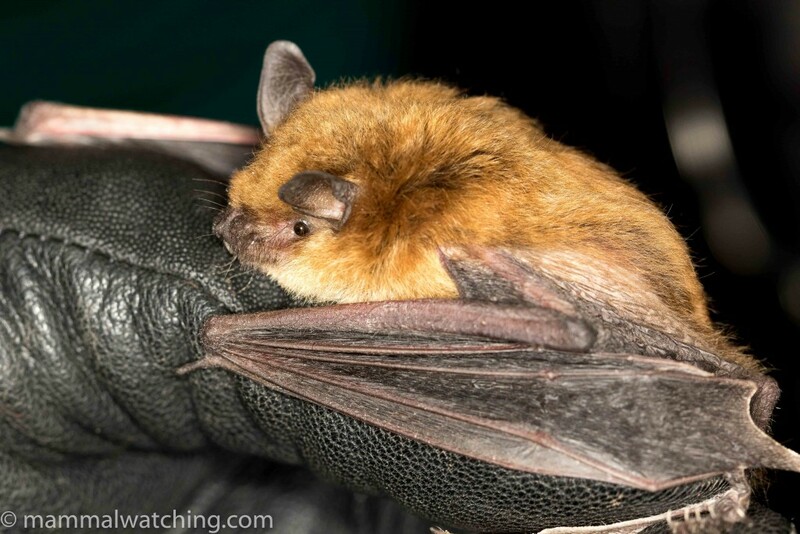 There was only one likely new bat left for me to see: Long-legged Myotis. And, as promised, we caught many. The keeled calcar – the small flap – on the tail membrane just above the foot is distinctive for this species. 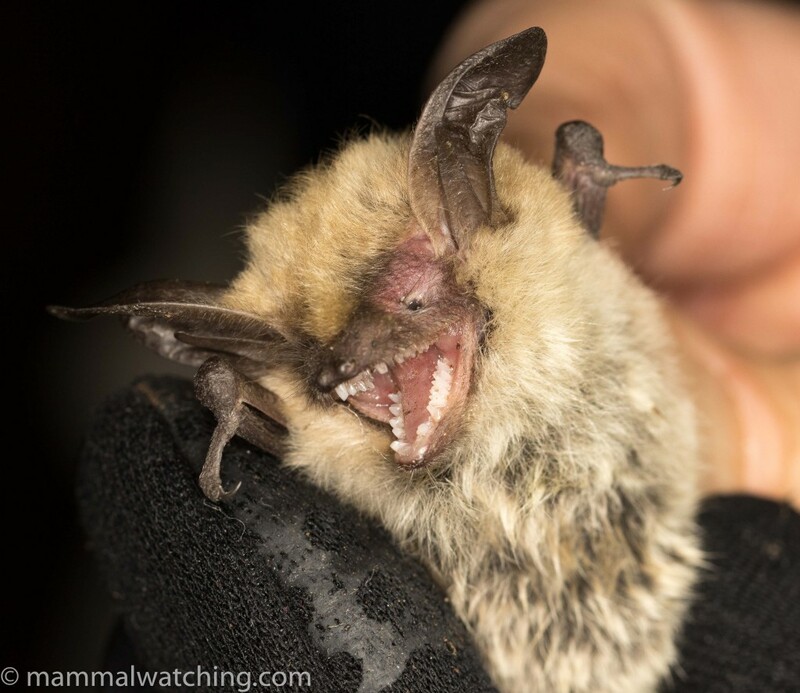 The team caught 150 bats that night, with almost 60 Big Brown Bats and over 50 Long-eared Myotis. 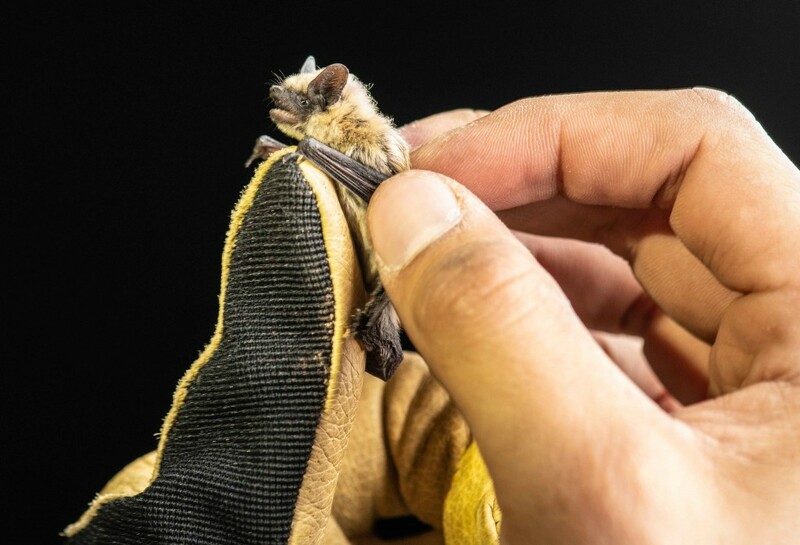 The only other new species for the trip were a few Western Small-footed Myotis, confirmed from an analysis of their echolocation calls on release. 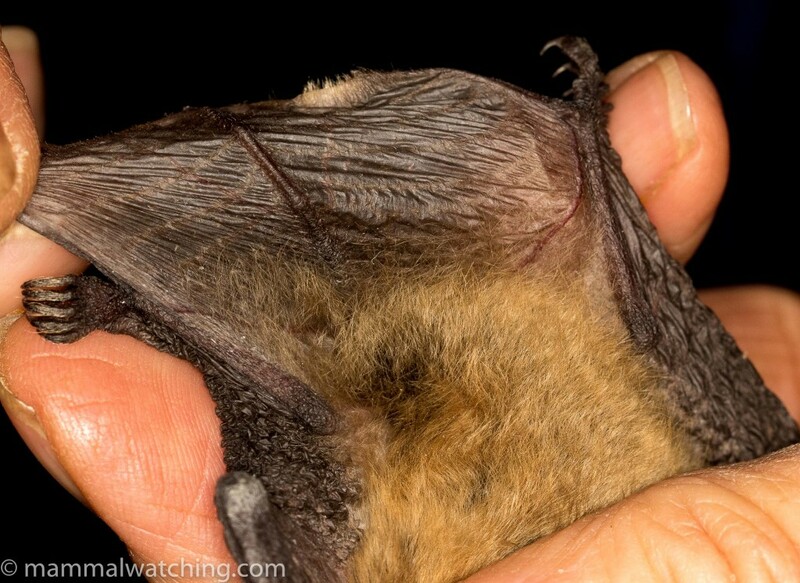 This is a species we thought we might have caught earlier on but which is extremely difficult to distinguish from California Myotis in the hand. By 11.30 – with temperatures below 10C -we were getting cold, tired and restless. 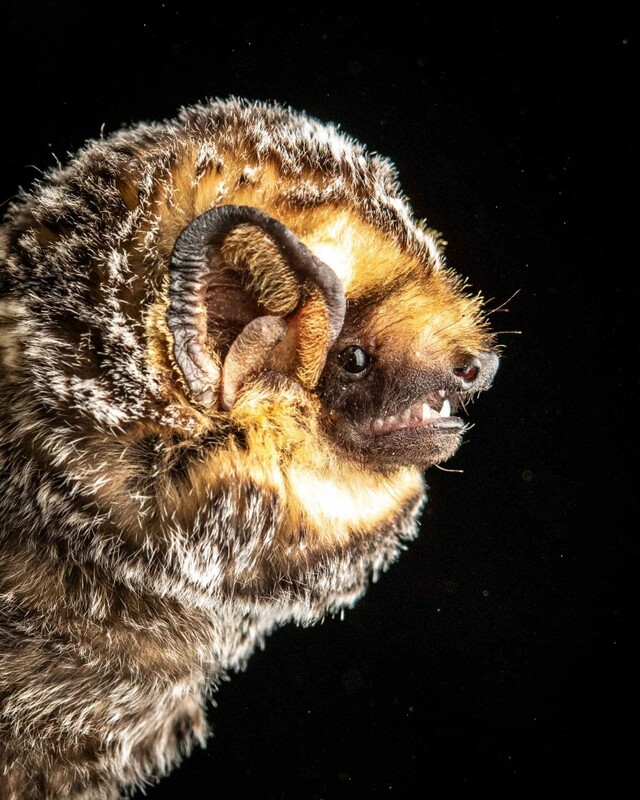 The air was heavy with the audible calls of echo-locating bats: we could hear the very loud metallic chink of Western Bonneted Bats and (slightly quieter) chinks of Big Free-tailed Bats continuously. 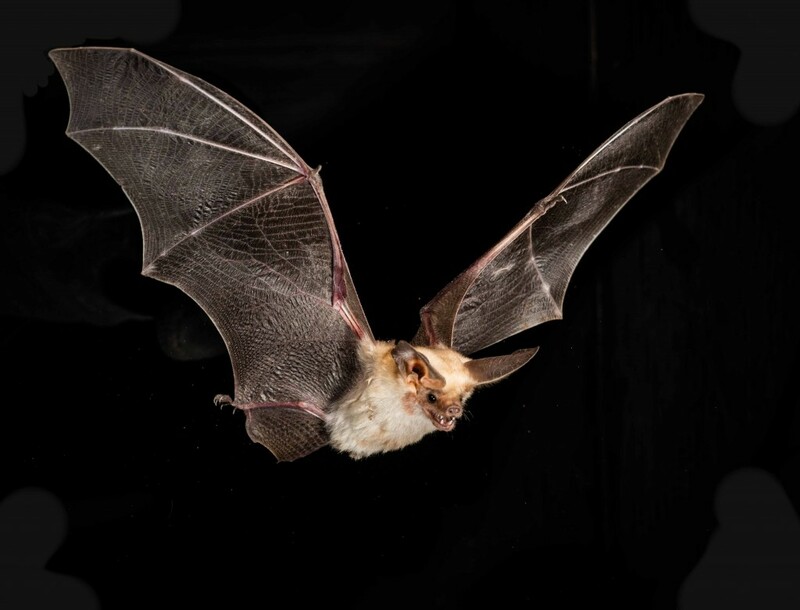 And every now and again we could hear the geiger-counter clicks of Spotted Bats. We were keeping our distance from the pond, anxious not to spook any Spotted Bat from the nets, as they seem very sensitive to noise and light. Carol had told us that there were a bunch of Spotteds feeding over the pond and she hoped that they would soon decide to drink. But would we catch one? Just before midnight she wandered over nonchalantly to ask how much longer we wanted to give it. “Until dawn” I said. “No need” she said. “We have two!”. I’m pretty sure the rest of the group were trembling as much as me as she – painstakingly slowly – produced two animals for a brief photo opportunity. 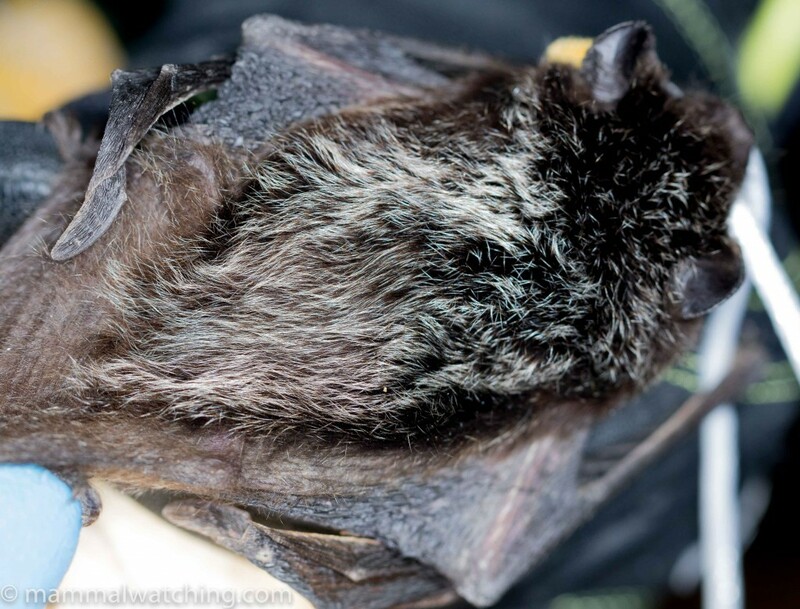 These are truly spectacular bats and not just for the black and white markings. It was very cold and five minutes later were at the pond to release the animals, and watched them flutter away moth like into the night. The perfect end to a fabulous trip. A very big thanks to Fiona Reid for all her logistical organisation, humour, patience and industrial quantities of sandwich fillings. Thank you again to the batting crew – Sybill Amelon, Clarissa Starbuck, Jose Gabriel Martinez and Bill Noble – for a lot of hard work wading through muddy ponds. They made sure we got decent looks at every species, no mean feat when you are in the thick of processing a hundred captures in an evening. Thanks also to Charles Hood and Jose for sharing their photos with us all. And a very big thanks to Carol Chambers for masterminding the bat catching, allowing us to share in her expertise, and getting me so many new species. 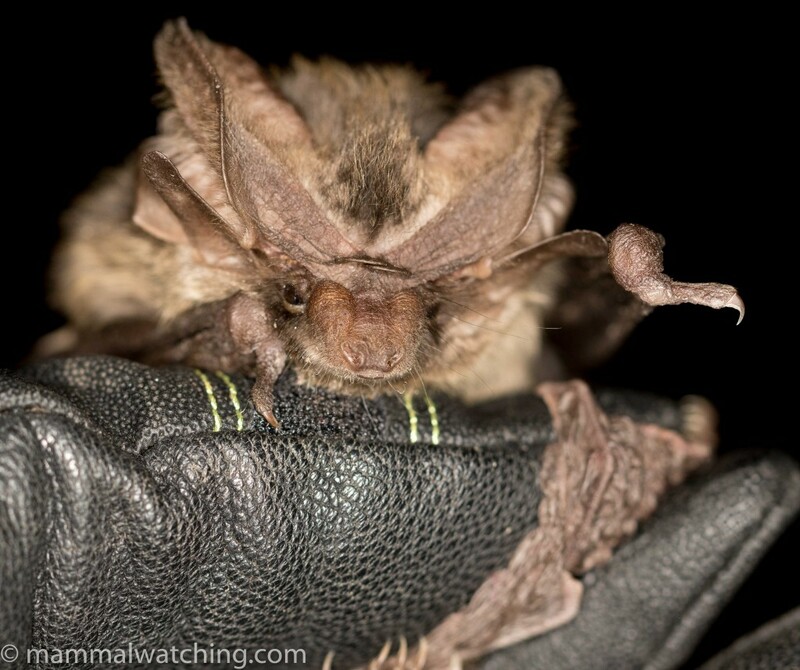 Hoary Bat, Lasiurus cinereus. Photo Charles Hood. Superb trip report from an excellent trip! Thank you for putting it together so well. Wonderful report and amazing pictures! I’ve subscribed now so I can read about your future adventures! Oh, I see, you’ve seen one in flight before. Much more beautiful close up! Well, what can I say? One of your photos is mislabeled. Don’t leave us hanging, Vladimir—which photo is mislabeled?